you get to see a young guy pull off a show-stopping performance on Patriots Day of all days. All while thousands of people ran in the 113th Boston Marathon. that one run was the only one allowed all game. The bats got going in the first, when Jacoby Ellsbury led off with a double. A single from Dustin Pedroia scored the speedy Ellsbury, and a ground out from Baldelli brought in Dustin, putting the Sox up by two. runners make their way through Kenmore Square. The Orioles scored in the third, and it remained close until the bottom of the sixth. Another RBI single for Pedroia and a triple from David Ortiz made it 6-1, Red Sox. batters, Mike Lowell had an RBI double and an RBI single in the inning. Also with RBI singles in the seventh were Ellsbury, Pedroia, and Youkilis. RBI, and a run scored. Lefty pitcher Hunter Jones made his major league debut, and pitched a scoreless 9th for the Red Sox, while Rocco Baldelli left the game in the fourth with a mild hamstring strain, and Orioles third-basemen Ryan Freel left the game in the third after being hit by a pick-off attempt from Masterson. He went to the hospital as a precaution, but there is no news yet on when he will return to the Orioles line up. thrown more innings in the past two years than anyone, Goliath himself, had one really bad day. But it wasn’t his fault. It was windy, so the pitches weren’t going where he wanted. 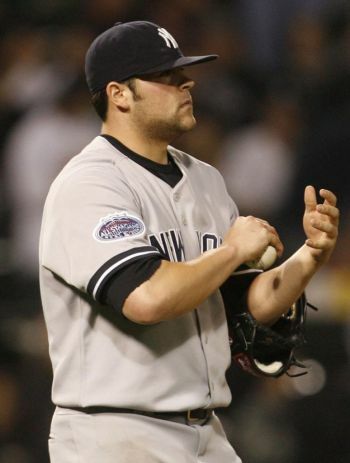 The crushing weight of being the Yankee’s ace was way too tough, he’s not used to it yet. he pitched in the minuscule zone, the Orioles would hit it. So he had no choice but to walk five batters. people rooting for the home team and that really threw him off. May 1st, I’m sure he’ll do better. great competitive year in the AL East. articles, check them out: Part 1 and Part 2. Today we’re going to look at J.D. Drew and Jason Bay, then take a quick look at the Red Sox pitching staff. clutch hits and helped the Red Sox reach game 7 of the ALCS. day Boston fans officially forgave J.D. Drew. Drew hit .280 with 103 hits, 19 dingers, and 64 RBI. down. He hit .265 with 9 hits and 1 RBI. his back will bother him. home runs, it could go higher if he is rested when he starts slumping. 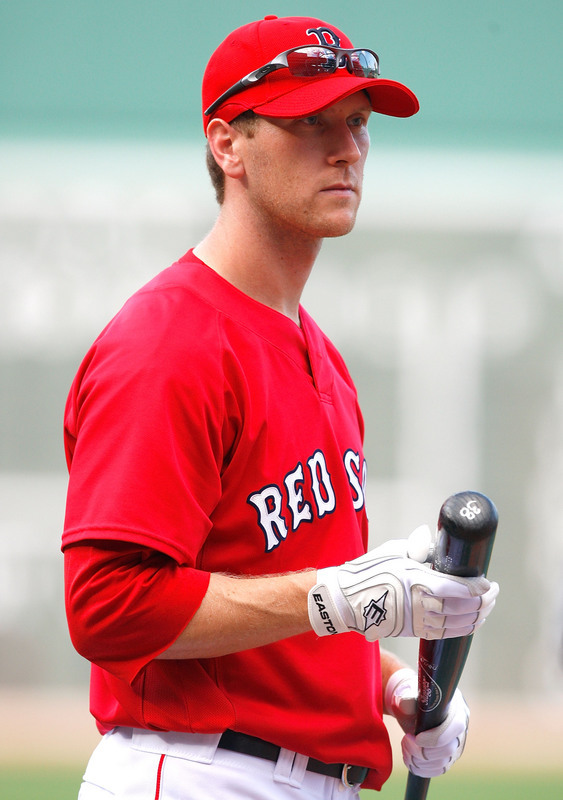 Next we’ll look at Jason Bay. Jason had a monster season last year, coming off an injury-dampened 2007. How will he look in his first full year as a Red Sox? with 165 hits, 31 homers, and 101 RBI during the regular season. This spring, including his brief stint at the World Baseball Classic, Bay hit .285 with 12 hits, 4 home runs, and 11 RBI. might be the strength of this Red Sox team, despite a talented line-up. are looking to make another run at the post-season. look at Papelbon to close things out. innings, with 70-75 earned runs, 40-45 walks, and 185-190 strikeouts. I’d look for him to post an ERA around 3.15-3.25.
last season, and should continue to build on that in 2009.
strike outs. I’d look for him to post an ERA of about 3.18-3.28.
have a low number of walks, he’s just looking to have a break-out year. ERA to settle out around 2.90-3.10.
as much if he can get the run support. Tim Wakefield is going to give up two or three runs a game. His season record depends on how much run-support he gets. perform. It’s a sort of waiting game with him. 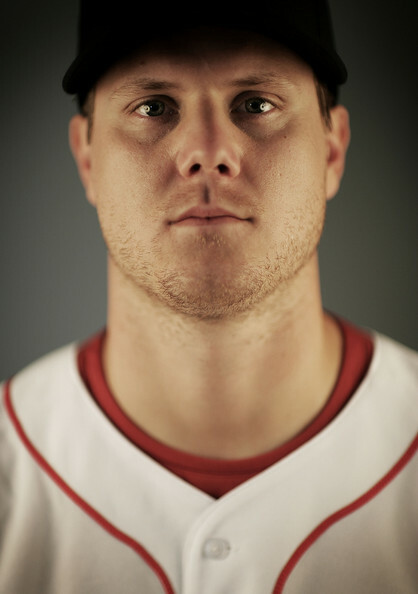 And now we’ll close this series off with one of the game’s elite closers, Jonathan Papelbon. saves this season and post an ERA of 2.60-2.80.
lefty-specialist Javier Lopez, and many others. the Yankees and the Rays, so I think we’re in for a very exciting season. Now that Jay Cutler is on his way out of Denver, we have to look at what started this whole ordeal and why it ended in such a messy divorce. Many people blame rookie head coach Josh McDaniels, but how can you? Maybe he didn’t handle the situation as well as someone with more experience. But, looking at their stats last year, you can’t blame him for going after Matt Cassel. 1. Josh knows Cassel and knows how he works. I would compare it to someone getting a new job and bringing their old secretary with them because they know each other and how things are organized and how they both work. Its comfortable, its a good plan, and would ease some of the transition from offensive coordinator to head coach, probably making life easier on the entire coaching staff. 2. Cassel was better than Cutler last year. The Broncos played in a weaker division, with the Chiefs and the Raiders, their only competition coming from the Chargers. The AFC East had three possible playoff teams the last week of the regular season. Here are Matt Cassel’s stats for 2008 and Jay Cutler’s stats for 2008. You compare. You might say these numbers are virtually the same, but again, you have to look at the division. 3. Finally, the NFL is a business. They are in the business of winning, and they have the weapons, McDaniels wouldn’t have been a good coach if he didn’t look into upgrading one of those weapons. He has to look at all the options before just taking what he was given. So, if McDaniels was not making a bad decision in terms of coaching, then why all the drama? Here’s why: Cutler has handled this situation as poorly as anyone could. In Cleveland, Derek Anderson and Brady Quinn hear trade rumors every day. In Chicago, there is similar QB unrest. Even look at baseball, Mike Lowell was on the trading block because the Red Sox wanted Teixiera. They didn’t get him, and Lowell is fine. All of these men take the trade talk in stride, understanding that it is a business, and their teams have to try and get the best player to help them win. In fact, most of these guys take the trade talk as motivation, to prove to their teams why it was a good idea to keep them. That’s all Cutler had to do. He is supposed to be the leader, and as a leader, you take the punches and turn them into motivation. You don’t whine, ignore the team like a 13 year old girl sulking after being told “no”, you understand its a business, and roll with it. Jay Cutler would have had a great year under McDaniels, he’s pretty good at offense, and he could have put Brandon Marshall and Eddie Royal to good work. Now I guess we’ll never know. can read that article here, if you haven’t.This is the second in what will be a series of articles. 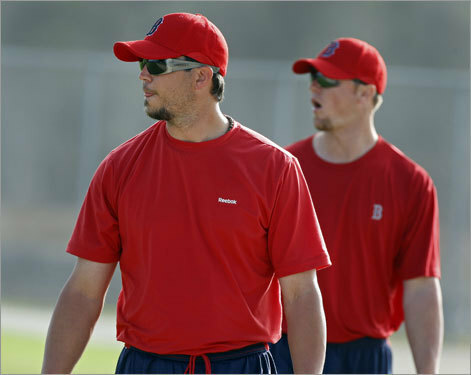 Today I’m going to look at the question marks of the Red Sox, Mike Lowell, Jed Lowrie, and Kevin Youkilis. We’ll start with Mike Lowell, who had offseason surgery to repair a torn labrum in his hip. 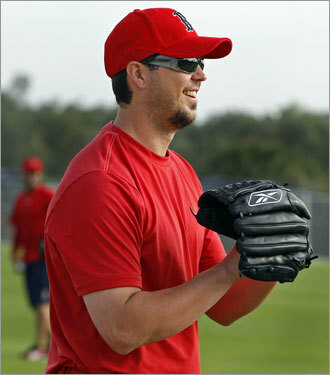 In Spring Training 2007, Mike hit .170 with 9 hits, 3 homers, and 8 RBI. In his World Series MVP 2007 Season, he hit .324 with 191 hits, 21 dingers, and 120 RBI. 2008 was a down year for Mike, mostly due to his hip issue. He hit .274 with 115 hits, 17 homers, and 73 RBI. year, Lowell has hit .286 with 9 hits, 3 home runs and 4 RBI. Next we’ll look at the Jed Lowrie. million dollars riding the bench. Lowrie is difficult because he is young, and we don’t know what to expect from him yet. take into account injuries, slumps, and hot streaks. So how will Jed do in 2009? Next we move on to Kevin Youkilis. where all the stats in the world can’t predict the answer. .288 with 152 hits, 16 homers, and 83 RBI in the regular season. 2008 was Youk’s year. He finished 3rd in the AL MVP race and had a career year in terms of hitting. In spring training, he hit .297 with 11 hits, 3 home runs, and 8 RBI. During the regular season, Youk hit .312 with 1678 hits, 29 homers, and 115 RBI. In 2009, Youk played in the World Baseball Classic, which skews his stats a little. In the WBC, Youk hit .182 with 4 hits, 3 homers, 9 RBI, and 6 walks. In spring training, Youk has hit .208 with 5 hits, 1 home run, 3 RBI and 4 walks. 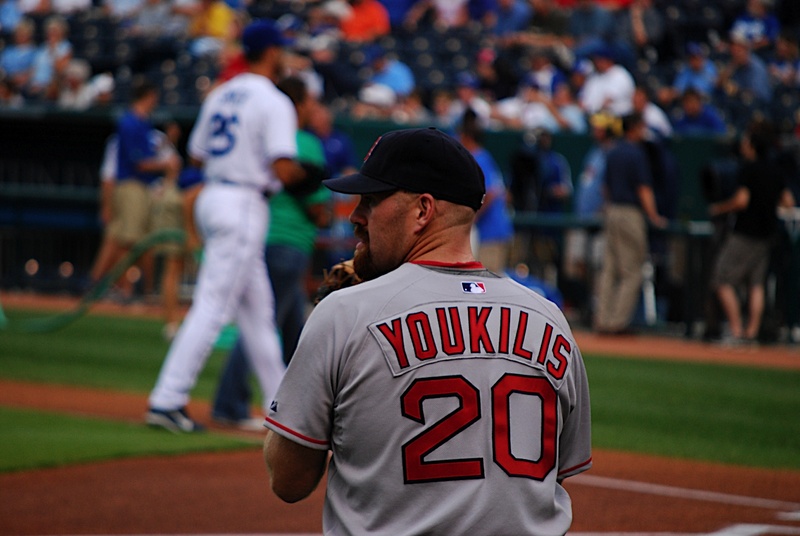 So what does Kevin Youkilis regular season look like? 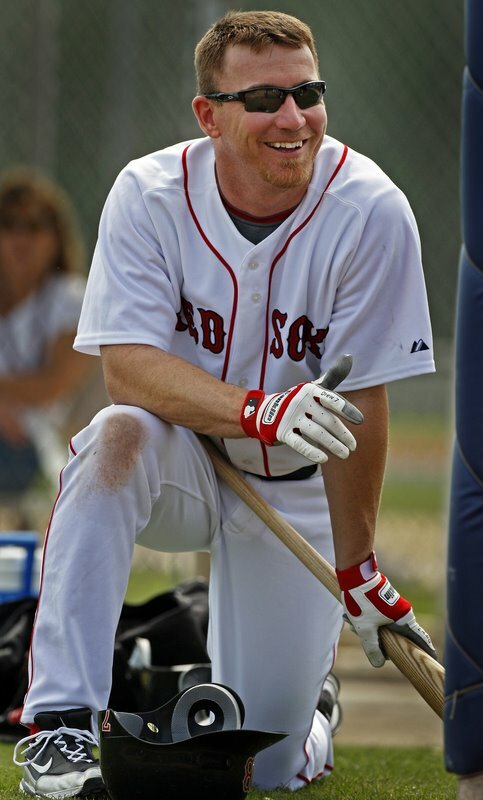 If he doesn’t slump after the All-Star break, I think Youk can hit around .285-.300, with 95-100 RBI and 20-25 homers. Of course, his OBP will be high, as usual, because he’s a tough out, and he should be pretty good protection for Ortiz this year. That’s all the analysis for today. Next I’ll look at J.D. Drew, Jason Bay, and the pitching staff.